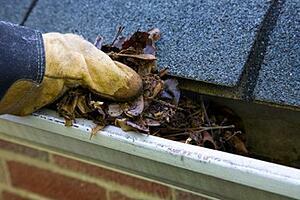 Clogged gutters can overflow, and then pooled water can rot the wood fascia and rust the gutters. Mold, mildew, and bacteria can grow, and pollen can collect. Full gutters can collapse, pull away from the house, and cause expensive damage. Rainwater that is not collected (due to full gutters) can pool around your home’s foundation, causing costly damage or even flooding. So, what are the shortcuts to getting clean gutters fast? There is bad news and there is good news. The bad news is …there are no shortcuts. You have to haul out the ladder, put on your heavy-duty work gloves, and dig in. Scoop out all debris, including sticks, sopping wet piles of leaves, pine needles, insect nests, critters, gunk, and everything else inside those gutters. Watch out for screws and sharp edges inside the gutters that can really wound your hands, even with work gloves on. Then flush the gutters and downspouts and clean up. The good news is that you can find a great gutter cleaning company and leave this unwanted and unsavory chore to the professionals! First Coast Home Pros is the best gutter cleaning company Jacksonville homeowners rely on! Clean gutters are extremely important here in Riverside, Avondale, Mandarin, Nocatee, and the beaches, where hurricanes and heavy rains befall us regularly. And in such a warm and verdant state, gutters are frequently filled and overflowing with leaves, Spanish moss, pine needles, and more. Our customers trust us to keep their gutters clean and clear, and our gutter cleaning technicians are trained extensively to clean and flush gutters and downspouts safely, efficiently, and completely. Let us get your gutters clean so that you don’t have to!